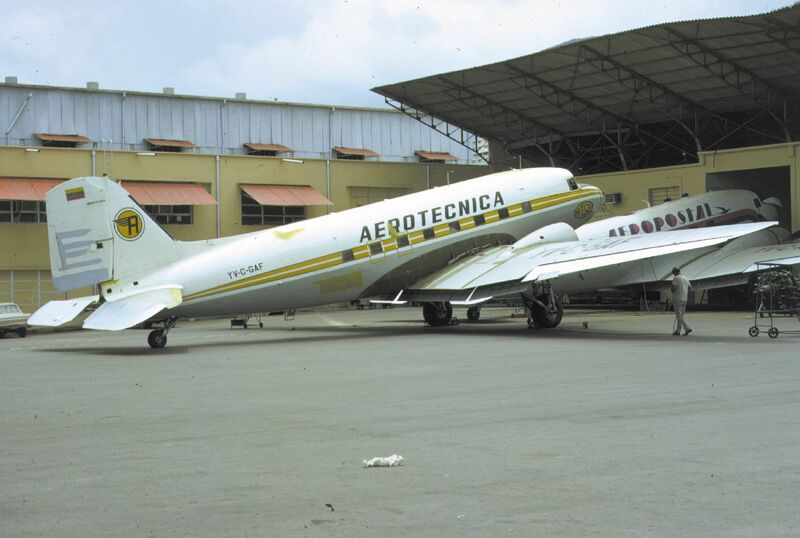 Aerotecnica  ATSA Simón Bolívar International Airport 1951 Continued operations with smaller equipment (helicopters). ^ "The World's leading Airline Intelligence Provider since 1998". ch-aviation.com. Retrieved 2019-03-06. ^ "Since 1997, ATDB is the only service providing an accurate global and permanently updated details of all worldwide transport aircraft, airlines, private and government operators - and leasing companies". aerotransport.org. Retrieved 2019-03-06. ^ "flickr.com - Aeroandinas". Retrieved 2019-03-06. ^ "i.pinimg.com - Aerotecnica". Retrieved 2019-03-06. ^ "worldairlinenews.files.wordpress.com - Costa Airlines". Retrieved 2019-03-06. ^ "airliners.net - Kavok Airlines". Retrieved 2019-03-06. ^ "netairspace.com - Perla Airlines". Retrieved 2019-03-06. ^ "jetphotos.com - Rainbow Air". Retrieved 2019-03-06. ^ "planespotters.net - Turpial Airlines". Retrieved 2019-03-06. This page was last edited on 6 March 2019, at 23:27 (UTC).